Happy Fourth of July, readers, and happy birthday to the United States of America! 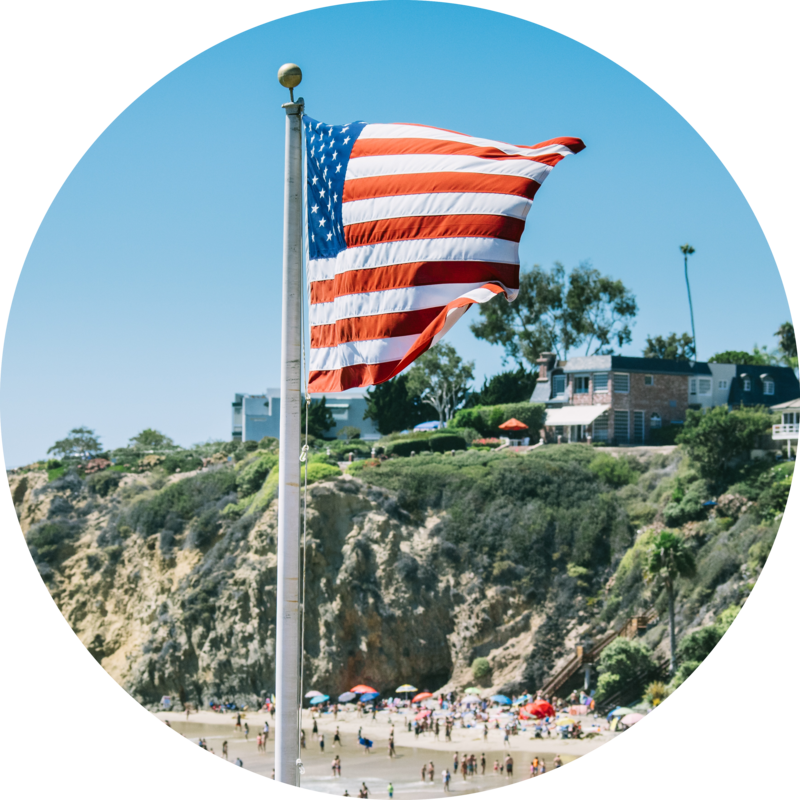 Today marks the 241st anniversary of America’s Declaration of Independence, and to celebrate there will be a plethora of fun activities taking place across the pond—from family BBQs to parades to fireworks. But how are ecommerce marketers marking the big day? Well, in addition to some pretty epic shopping sales, many brands have given their email marketing an Independence Day twist. From Tommy Hilfiger to Kate Spade, here are a few of our favourites so far. We'll keep updating this list throughout the day, so keep an eye out for your brand! 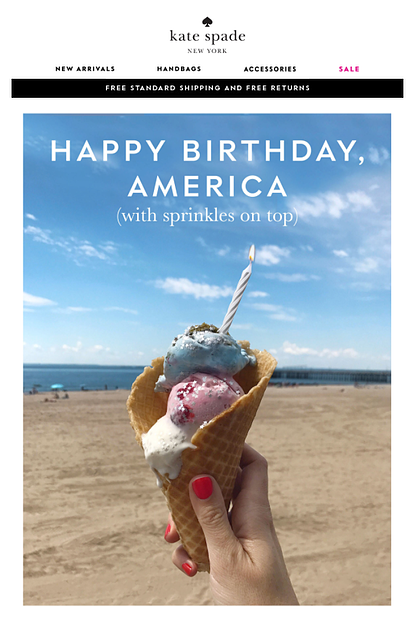 One may be used to associating Kate Spade with the Big Apple, but the brand’s “Happy birthday America” email stands out for its distinctly coastal feel. Using a natural, seemingly spontaneous photo, the email shouts “relaxing, sunny getaway”... with sprinkles on top. Women’s clothing brand LOFT uses a white, red and blue, GIF-tastic email to both promote its 4th of July sale and wish America a “HBD”. Another brand opting for a tactically red and blue email is American shoes and accessories designer Steve Madden. Brownie points for the pun on “fourth” in the headline: “Go fourth for a limited time 25% off”. Nice work! 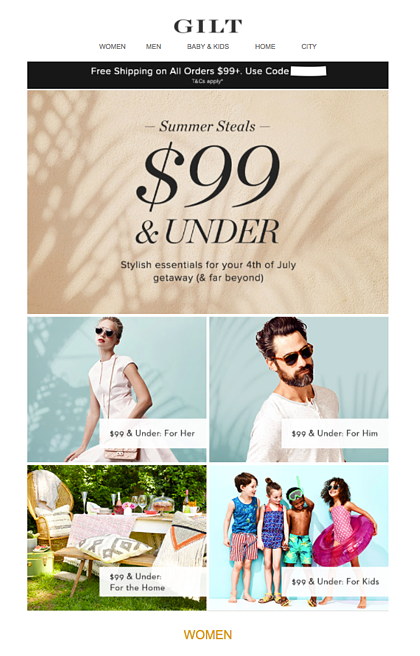 Online shopping company Gilt focuses on the idea of a “4th of July getaway”, promoting “stylish essentials” that are under $99 for the trip (as shown in the snapshot below). This is a more subtle take on 4th of July email marketing, but effective nonetheless. The NYC based shoe brand Idoni may make its shoes in Italy but that doesn’t stop it celebrating America’s National Day. Focusing more on useful content than sale promotion or well-wishes, the brand offers five tips for marking the “long weekend”. Like LOFT, Tommy Hilfiger goes all out with a fun gif (this time a firework) to spread the word about its sparkling 4th of July sale. 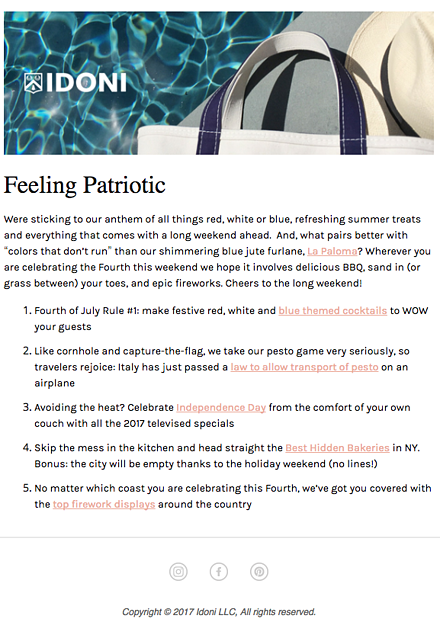 From the hot dog's dancing hat to the pun-tastic call-to-action (CTA) "ketchup on shopping", this email from J.Crew ticks all the right boxes for Independence Day email marketing. 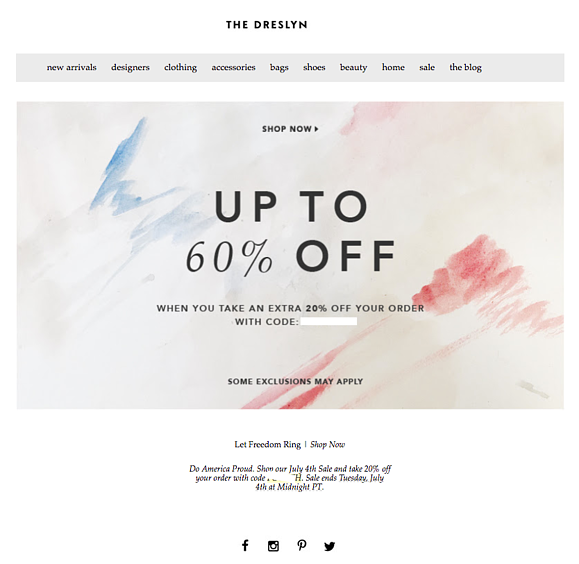 As well as its seriously stylish ecommerce site, super cool blog posts and immaculately presented social channels, the fashion and homeware retailer has also managed to master the art of on-brand emails. Whilst sticking to the day's colour palette of blue, white and red, The Dreslyn still manages to retain its stylish and elegant identity by using a simple but nevertheless arty background, and succinct copy. 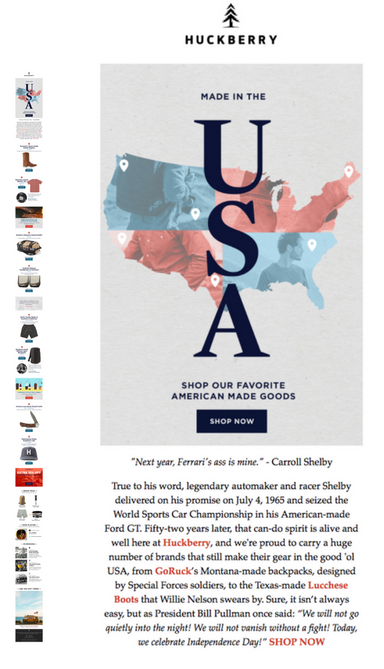 The email goes on to celebrate the famous American automotive designer Carroll Shelby, before listing an array of items sold by Huckberry that have all been made in the USA—ranging from a pair of western boots to Southern California made swim trunks.